The Ultimate Cake Off contestants wait to hear the judges' verdict. Tonight TLC premiered their new show Ultimate Cake Off, which will take over for the Cake Boss after his season finale at the end of the month. Ultimate Cake Off features cake designers of varying styles, backgrounds, and experience to compete against one another for a cash prize and event feature. 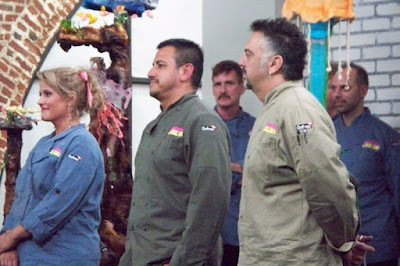 For this premiere episode of Ultimate Cake Off, the three cake designers were competing to be the featured cake at Aquarium of the Pacific's Shark Summer Celebration. The first odd thing about the show was that the contestants were told that the client's opinion was the dealbreaker--yet there was no discussion between the clients and designers. There may have been some interaction off-camera, but it seemed jarring not to see it. On Cake Boss, we always get a glimpse into Buddy's conference with his clients. The competing designers, Ashley, Tariq, and Richard, had to create a shark-themed cake that was kid-friendly, 5 feet high, and 60% edible. Richard set out to make a tower cake with a tubed water feature at the top, adorned by a shark fin. Tariq worked on a traditional stacked cake with multiple layers adorned with shark sculptures, including a shark bursting out of the cake. Ashley had a wildly ambitious design with a sculpture of coral, seaweed, all manner of sea creatures, and a rotating shark at the top. Ultimate Cake Off followed the three designers as they worked with their teams. Then suddenly the judges broke in to give them a cake sculpture "contest". The person who sculpted a realistic crab replica would get to boot another designer from the cake-making for 30 minutes. Ashley looked furious, and I couldn't blame her. This was a needless bit of "drama" inserted into an already interesting contest. It also seemed silly to test contestants that they selected for the show. It was almost like they were saying they hadn't vetted these people at all for Ultimate Cake Off, and weren't sure what the client was going to get. Later they inserted another challenge, a taste test of their cakes. This made a little more sense, since it's fine when a cake looks pretty, but who wants it if it tastes awful? The only confusing thing was that it didn't look like the designers actually used those style of cakes in their designs, but perhaps this was something that wasn't shown. Both Ashley and Tariq lost a half hour due to these Ultimate Cake Off contests. Personally, I would have much preferred that the winner *gained* a half hour. This way it would be good for the winner, and wouldn't generate unneded animosity between contestants. The usual mishaps ensued, as happens when you have an unrealistic deadline. Ashley cut her thumb severely. Tariq's cake was crooked. Richard's water feature broke. In the end, Richard felt his finished cake was not up to par, and the judges agreed. Tariq's cake was bright and cheery and a little cartoonish. Oddly, the Ultimate Cake Off client who had seemed somewhat put off by the idea of a cake-eating shark now complimented that very feature. The judges also felt the event logo was prominently and properly displayed on the cake. They were worried by the odd tilt of the cake, however. Ashley's cake was, in fact, a master work. Even both other cake designers acknowledged it as such. The myriad of spun-sugar sea creatures and seaweed was astounding. The client complimented the accuracy of the sharks portrayed on the piece. The judges found fault with the dark colors of the cake, and were upset about the logo not being more on display. At the end of Ultimate Cake Off, Tariq's cake was chosen, for what seemed very flimsy reasons. The client actually didn't seem like she agreed with the decision but was pressured by the judges. If the criticism of Ashley's cake had been that it wasn't as easily edible as Tariq's more traditional cake, I would have understood. But with the lame excuse of it being "too dark" (because the depths of the ocean are so bright) and the logo not being front and center? Erm, what? As if the people standing at the shark event eating the shark cake weren't going to know it was for the shark event? 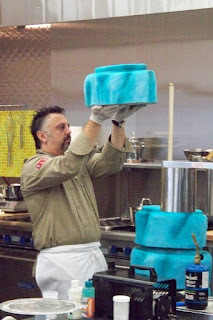 Ultimate Cake Off has the potential to be a fun show that gives us more of what we love about Cake Boss--watching talented artists create amazing edible sculpture. I just hope that they find a way for this competition to be move away from the more negative tone, with harsh judges and back-stabbing contestants. The premiere episode had contestants who just wanted to make a beautiful cake and please the client, and get some rewards for their hard work. That's not a bad premise for a show at all. Watch Ultimate Cake Off on TLC, Monday nights at 10/9c beginning August 31. Check your local listings for the abundance of repeat showings of the premiere episode, "Shark Summer". PHOTOS: Ultimate Cake Off contestants Ashley, Tariq, and Richard, c2009 Eric Biermann, TLC. You hit the hook right into the shark. Ashleys cake was amazing. And didn't they say to incorporate it into the design? She did that. I thought Tariqs looked clumsy and thrown together. The sharks didn't look real. I know he wanted the kids to not be scared of sharks, but isn't the dangerous look of a shark part of the excitement? Susan B.